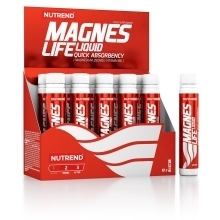 Magneslife strong - high content of magnesium in dose. Large dose (375mg) of fast absorbent liquid form of magnesium enriched with vitamin B6. Athletes usualy use this product as first aid during urgent lack of magnesium. Deficiency of magnesium can cause cramps, slackness or headache. Heavy physical activity, diet mistake or high level of stress can lower the level of magnesium in body. Together with vitamin B6, it stops the tiredness and fatigue, it supports electrolytic balance, supports energetic metabolism and helps to normal nerve system functioning. Magnesium also brings normal syntesis of proteins and muscle activity.